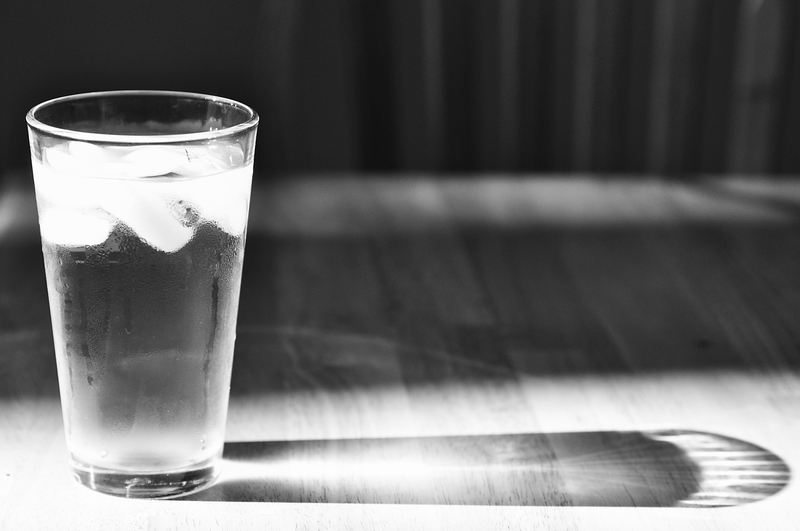 Are you concerned about the health effects of fluoride found in drinking water? Do you want to safely remove fluoride from your drinking water but aren’t sure which water filter to use to do this? iSpring is one of the most popular under sink water filter brands currently on the market, with several different models available for purchase. 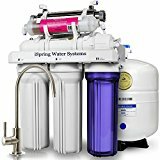 The iSpring RCC7 5-stage under sink reverse osmosis water filter system is currently an Amazon best-seller, and is a great option for removing fluoride. Home Health Living has compiled a review of the different iSpring water filter models currently available. 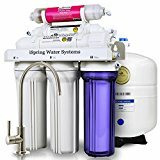 A current best seller on Amazon, the iSpring RCC7 is a 5-stage reverse osmosis under sink water filter that is the only reverse osmosis system on the market with a Gold Seal Certification by the Water Quality Association. It’s a high-quality, safe and durability under sink water filter and is made in the U.S.A. You’ll get years of use out of your iSpring RCC7 water filter system. It filters up to 99% of contaminants including chlorine, fluoride, lead, pathogens, pesticides and sulphurs. The water filter purifies up to 75 gallons of water per day (283 litres). If you have heavily chlorinated water or you use well water, you’ll be pleased to know that the iSpring RCC7 is suitable for use with well-water. Your tap water passes through 5 different stages within the water filter. The first stage features a 5-micron sediment filter which removes common sediments such as dirty, rust and silt. These sediments typically clog a reverse osmosis system, so it’s important to get rid of them first. The second stage uses a 5-micron GAC filter, which is a granular activated carbon filter. If you have heavily chlorinated water, most of the chlorine taste and odor will be removed during the second stage. Other contaminants that are removed during this stage are mineral oil, poly aromatic hydrocarbons, phenol and halogenated substances. A denser carbon block filter is used during the third stage, which removes any residual color, tastes ad odors. It is during this stage that chemicals that are difficult to remove, are removed, such as chloramines. These three stages combined create a fairly pure water, ready to pass through the fluoride filtration stage. This is the 4th stage, which involves the use of an NSF-certified reverse osmosis membrane. This is a process that is also used when producing bottled water. The water is pressed through the membrane, which is semi-permeable and features micro sized holes that enable arsenic, lead, copper, chromium, sodium and other contaminants to be removed. It is during this stage that cysts such as cryptosporidia and giardia are removed. The membrane is created form 3M materials, making it a high-quality membrane. After water passes through the four filtration stages, it sits in a storage tank ready for use. The storage tank is an NSF-certified metal pressurised storage tank with a high-grade butyl diaphragm. Worried about lack of space when installing the storage tank? The great news is that you can install it vertically or horizontally depending on the space available. The 5th and final stage of filtration uses another granulated carbon filter that is much finer. This is known as a post carbon filter. Its purpose is to filter the water that leaves the storage tank. It’s a final polishing filter. Are you concerned about the amount of water wastage that occurs with a reverse osmosis system? The iSpring RCC7 is different to other reverse osmosis water filters because its ratio of purified water to waste water is 3:1, which means less water is wasted compared with other reverse osmosis systems. When purchasing the iSpring RCC7, included is a European-style goose neck faucet that is lead-free and comes in a range of finishes (such as stainless steel and brushed nickel). The faucet has a quarter-turn handle and comes with a durable ceramic valve. The dedicated faucet is the main source of output for the filtered water. However, if you want to, you could attach the system to your ice maker, coffee maker or your refrigerator output. The 5-stage filter is housed in a transparent cartridge so that you can easily monitor the performance of the filter. The water filter system has been designed to fit under most under-sink cabinets. The system measures 17.5 x 14.5 x 5.25 inches while the water storage tank measures 16 x 11 inches. The iSpring RCC7 has been designed with the user in mind. It’s very easy to install so you should be able to do it yourself without needing to hire a plumber. A wall-mountable bracket is included with the system to help with easy and handy installation. There is a user-friendly and detailed manual with 8-step instructions to install the system as well as detailed information about all the parts of the system. There is an installation video available and lifetime technical support assistance to help you with installation and any troubleshooting. The feed water adapter makes it easy to tap into your cold-water line when installing the iSpring RCC7 system. The angle stop valve measures 3/8” x 3/8” x 1/4”. A 1/2” adapter is also available if your cold-water line is 1/2”. If you’re worried about the storage tank overfilling and flooding, you’ll be glad to know that the iSpring RCC7 has an automatic shut-off valve to stop the water when the storage tank is full. There is also a water flood alarm. A highly sensitive probe can detect the water level and a loud alarm will sound, giving you extra peace of mind. Some people are hesitant about buying a reverse osmosis water filter because of the reduction in water pressure. This is understandable, and iSpring recommends using its RCC7P model instead, which features a built-in booster pump. Please read our review of this model within this post. The iSpring RCC7 comes with a limited money-back guarantee and a 1-year manufacturer’s warranty, as well as lifetime technical support. 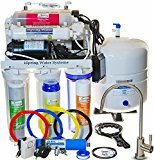 With the iSpring RCC7AK, iSpring has created a water filter system that caters to those concerned with some of the typical aspects of reverse osmosis. As we know, reverse osmosis removes almost all sediments found in water, including minerals and nutrients that our bodies need. 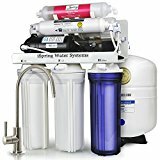 The iSpring RCC7AK is a 6-stage under sink reverse osmosis water filter system that adds an extra stage to remineralize the purified water. It adds back the minerals that are typically removed when the water passes through the membrane. It also has a lower level of water wastage compared with other under sink reverse osmosis systems. The ratio of purified water to waste water is 3:1. The first stage of the water filtration process is your water passing through the first sediment filter. This removes typically larger sediments, dirt, rust, odors. The second filter is a granular activated carbon filter that is designed to remove additional sediments such as polyaromatic hydrocarbons, phenol, halogenated substances, and mineral oil. It also further removes unpleasant odors and tastes. The third stage involves a carbon filter as well, but it is denser than the filter used during the second stage. This removes chloramines and other remaining odors and tastes. These three stages together purify the water as much as possible before the reverse osmosis stage. The fourth stage involves the use of a 3M NSF-certified reverse osmosis membrane made from cutting-edge materials. The water is pressed through this membrane, which is quite fine and removes fluoride and other contaminants that cannot be removed using carbon filters. It offers a high contamination rejection rate. Once the water has passed through the reverse osmosis membrane, it is stored in a holding tank, ready to be used. As the faucet is turned, the water leaving the storage tank passes through the fifth filtration stage. This involves a much finer carbon filter made of a high-grade carbon media. The purpose of this stage is to give the water one final polish after it has left the tank, before it reaches the faucet. The filter itself has recently been upgrade to a higher-grade carbon media which means that the filter now has a longer life span than the filter that was previously used. The final 6th stage of the iSpring RCC7AK under sink filter is the use of an alkaline filter that adds back ionized calcium, sodium, magnesium, potassium and helps increase the pH levels of the water to offset lost pH during the reverse osmosis stage of the filtration. This extra filtration stage was created in response to some consumer concerns about the minerals removed during reverse osmosis. The iSpring RCC7AK can purify up to 75 gallons per day, and is suitable for use with well water or heavily chlorinated water. The storage tank is a pressurized tank with a high-grade butyl diaphragm. This acts as a bladder, storing the water inside the tank until there is a demand for the water. When there is a demand for the water, the water is pushed out of the tank via air pressure. As the storage tank fills with water, air pressure increases. The iSpring system has a valve shut off which stops production of water when the storage tank reaches a certain level of air pressure. The storage tank itself can be positioned under your sink either horizontally or vertically. This helps you make use of the space that you have available. The iSpring RCC7AK also includes a goose neck faucet that comes in different finishes depending on your personal style and needs. All filters are also included, but replacements can be easily purchased. All the installation components are of high quality and are easy to install. The feed water adapter is a one-piece angle stop valve that measures 3/8” x 3/8” x 1/4”. There is a 1/2” adapter available if your cold water line is 1/2”, you’ll just need to contact the manufacturer. Worried about flooding? There’s no need to be worried because the system features a probe that detects water levels and sounds a loud alarm to let you know before any flooding occurs. Finally, you’ll be glad to know that the user manual has been redesigned to make it more user friendly and easy to understand. The installation instructions are very straightforward, and if you are still having trouble there is a video you can watch. You also have access to lifetime technical support! The iSpring RCC7AK comes with a 30-day money back guarantee and a 1-year warranty. The iSpring RCC7P-AK under sink filter is identical to the RCC7AK except that the RCC7P-AK also comes with a booster pump. This is important for households where the source water pressure is below 40psi. For the reverse osmosis to work effectively, a minimum of 40psi is required. By using the booster pump, the psi can be increased up to 80psi. 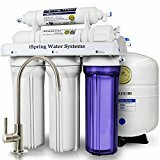 The iSpring RCC7AK-UV 7-stage under sink water filter system is almost identical to the iSpring RCC1UP-AK except that it does not include the booster pump. This makes the RCC7AK slightly cheaper than the RCC1UP-AK. Is it important to have the booster pump, you might be wondering? You will need the booster pump if your source water pressure is below 45psi, because the minimum required pressure for reverse osmosis performance is around 40-45psi. Using a booster pump can increase your water pressure up to 80psi. The iSpring RCC7AK has a 7-stage water filter that takes your source water through processes to help purify it, before it is ready for you to drink. It can filter up to 75 gallons of water per day. The first stage filter is a 5-micron filter designed to remove sediment such as rust, dirt and silt. This is done during the first stage because these sediments typically clog a water filter system. By removing them during the first stage of filtration, your water filter system is less likely to become clogged. This helps keep your filters working for longer and more efficiently. The next stage uses a 5-micron granular carbon filter that removes other contaminants such as chlorine, polyaromatic hydrocarbons and mineral oil, among others. This filter also reduces chlorine tastes and odors. This type of filter is commonly found in most water filter systems and products such as water filter pitchers. The third stage uses a denser carbon block filter to remove other difficult-to-remove chemicals, tastes and odors. It removes chemicals such as chloramines. The fourth stage is an important stage, because it is during this stage that fluoride is remove. This is one of the reasons why a reverse osmosis water filter system is so popular with households. The filter used during this stage is a semi-permeable membrane known as a reverse osmosis membrane. The membrane features microscopic holes that effectively remove fluoride, arsenic, lead, copper, and chromium, among other contaminants. It can also filter out cysts such as giardia and cryptosporidia. If you’re worried about water wastage due to the reverse osmosis stage, you’ll be pleased to know that the improved, high-quality reverse osmosis membrane means that the iSpring offers a high ratio of clean water to waste water, of 3:1. Most other reverse osmosis systems have a ratio of 2:1. The purified water now sits in a storage tank, ready for use. The storage tank has been upgraded to make it of even higher quality. It is made of high-grade butyl that is NSF certified. The tank features an auto shut off function which operates to stop the overproduction of filtered water. Once the tank is full, the system shuts off. However, the filtration process does not end here. When the water leaves the storage tank, it passes through a fifth filtration stage. The fifth stage uses a finer granular activated carbon filter to give the water a final polish as it leaves the storage tank. It then passes through the 6th stage which uses an alkaline pH filter. This filter adds back healthy minerals that were removed during the reverse osmosis process. This filter also helps increase the pH level of the water, which is important because reverse osmosis reduces the pH levels of water. And finally, the water passes through the seventh stage which is a UV sterilization filter. This filter kills any viruses and bacteria that were not filtered out during the reverse osmosis stage. This is particularly important for households that rely on well water and do not use municipal/town water. The UV filter is switched off when water is not passing through it, which helps to prolong the life of the filter. As with the other iSpring reverse osmosis water filters, the RCC7AK is very easy to install yourself. All the installation components are included in the package. There is a user-friendly instruction manual that has been updated to make it even easier to understand and follow. It features easy to understand instructions and pictures. If you still find it hard to install the system, you can contact the iSpring technical support team. The installation connections are quick-fitting and there is also an included wall-mountable bracket. The water storage tank can be mounted either vertically or horizontally. You get to choose depending on the space that you have available in your cabinet. A feed water adapter is included in the package, measuring 3/8” x 3/8” x 1/4”. This allows you to easily tap into your existing cold water line. If your cold water line is 1/2”, there is a 1/2” adapter available from the manufacturer. The dedicated faucet included with the system has a European look- it is a goose neck brushed nickel faucet in a stainless-steel finish. The quarter-turn handle has a smooth operation and there is also a durable ceramic valve. These have recently been upgraded. There is also a water flood alarm for extra peace of mind. This alarm is a highly sensitive probe that detects low water levels and sounds off an alarm to alert you to the problem. The iSpring RCC7AK has a 30-day money back guarantee and a 1-year limited warranty, and lifetime technical support. The iSpring RCC1UP-AK is almost identical to the RCC7AK water filter, except that it also comes with a booster pump that can increase water pressure to 80psi. This is important for households where the source water pressure is below 40psi. For the reverse osmosis to work effectively, a minimum of 40psi is required. The other difference between the iSpring RCC1UP-AK and the RCC7AK is that the former can filter up to 100 gallons per day, which is more than the 75 gallons filtered by the RCC7AK. As is typical of reverse osmosis water filter systems, the water pressure is reduced due to the use of the reverse osmosis membrane. To combat this issue, iSpring has included a booster pump with the iSpring RCC1UP-AK water filter. The purpose of the booster pump is to increase the water pressure up to 80PSI. This is suitable for those households whose source water has low pressure. The booster pump has been upgraded from previous models, and its new and better design makes it work more efficiently. The iSpring RCC1UP-AK comes with a 30-day money back guarantee and a 1-year limited warranty. Lifetime technical support is available. If you’d like to read more about under sink water filters, here’s a post reviewing the best under sink water filters.